• Genuine Honda Motor Oil • Premium-grade 0W-20 detergent oil with an API Certification Seal on the container. Oil is a major contributor to your engine’s performance and longevity. If you drive the vehicle with insufficient or deteriorated oil, the engine may fail or be damaged. This seal indicates the oil is energy conserving and that it meets the American Petroleum Institute’s latest requirements. 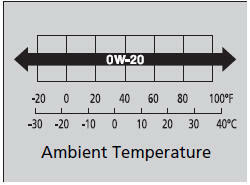 Use a Genuine Honda Motor Oil or another commercial engine oil of suitable viscosity for the ambient temperature as shown. You may also use synthetic motor oil if it is labeled with the API Certification Seal and is the specified viscosity grade. Your vehicle does not require oil additives. In fact, they may adversely affect the engine performance and durability.